I have a love-hate relationship with leftovers. Most of the time, I really do love them. On the days I have way too many items on my to-do list and just don’t have time to cook – it’s great to just pull out leftovers to warm up and eat. But on the other hand, having a fridge full of little tid-bits of this and that? It makes my fridge look cluttered, which kinda makes me feel annoyed. This, my friends, is what we call a “first world problem.” Too many leftovers? So much food in my fridge that I can’t find what I’m looking for? So many people around the world long to have the “problems” I have. When I have to slide all sorts of bowls and jars around in my fridge, just to find the peanut butter stuffed way in the back? It’s a waste of a good thirty seconds of my life. Ooh, and you know what’s really annoying? When I make enough peas for each of us to have a nice serving. And then the last person leaves about 13 peas in the pan. Why? Just take the rest of the peas, for goodness sake! I do not want to find a little container for 13 leftover peas, and then put them into the fridge so that I can slide them all around when I’m looking for peanut butter. Likely, they’ll become forgotten and fuzzy because really? Who wants to take the time to re-heat 13 peas? Oh to have the luxury of complaining about “all” the food in my refrigerator. I truly am thankful for all of the food on my shelves – even the container of 13 forgotten peas. I promise to always be grateful for the cluttery tid-bits. And now for a real food recipe that costs a very small amount of money and uses up some of the leftovers that are taking up space in your fridge. In a large pot, bring chili and water to a boil. Add uncooked pasta. Cover and cook on medium heat until pasta is tender. Sprinkle in salt, according to your taste. Serve with shredded cheddar cheese sprinkled on top. Estimated cost of this meal? About 65¢ per person. And that includes the peas. All of them – even the last 13. 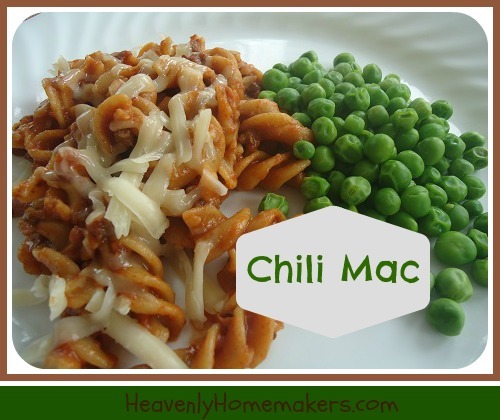 If you are sick of chili, and don’t want to eat your leftovers immediately – simply spread this Chili Mac mixture into a 9×13 inch baking dish, top with cheese, cover, and freeze. Reheat another day. Are you a fan of leftovers? Do you sometimes find a few straggly uneaten peas in the pan? 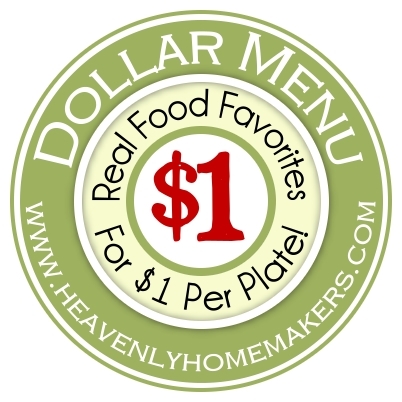 We eat leftovers for lunch every day – homeschool does have its advantages. My husband loves to take leftovers to work instead of sandwiches. 13 peas in our house would go out to the chickens! They get all the goodies leftover that won’t be enough to make into leftovers. Me three, except my mom would just throw it all into one big container! We would never know what we’re going to find in the soup????. But somehow it always tasted so good. I keep a soup container in my freezer. I put all those dabs and bits into that container when cleaning up after meals. It is even okay to have multiple kinds of meats and broths or gravies. The exception to this would be any kind of potatoes which are just nasty in this soup. When the container is full I dump it in a pot and add broth plus any produce that is on it’s last and occasionally some tomatoes. Simmer for 30 minutes and serve. Sometimes it is just okay and sometimes it is so delicious that we wish it could be duplicated but of course it cannot. I consider leftovers to be my money in my PTO (paid time off) bank. I overcook sometimes just to give myself a break. We love leftovers at our house! We homeschool and it sure makes for a quick and easy lunch the next day. We like pizza on Friday nights and that is the next best use of leftovers. We’ve created many new favorite pizzas – chili pizza is one of our favorites. This week I’m going to try chicken cordon bleu pizza! Keep a jar in the freezer for left over tidbits and broth off of cooked vegetables. You will have a good start on a pot of soup. I do this all the time. Leftover cooking boths make a base for a number of different soups. Last night I was complaining in my head about such a full fridge of leftovers that not one more thing would fit in it and then realized what my full fridge must look like to my Rwandan house helpers who don’t even have a fridge. It really gave me pause. I am so thankful for all the meals that have been provided for us while I have been on bed rest and so this morning I proceeded to freeze as much as I could to give us plenty to eat when our baby comes. I’m grateful for the new perspective God gave me and the reminder to be generous when others have been so generous to us. Beautiful post Rachel :-) God keep you and your baby. May you feel His strength as you deal with bed rest. My older children love to go looking in the refrigerator for a snack. I keep a large plastic container with no lid, labeled LEFTOVERS, on a shelf and put in all the small mismatched items (a few biscuits, a few random pieces of pizza, some leftover scrambled eggs, some leftover strawberries, etc.) They get put in there in separate bags or containers. It is usually things that I know won’t get eaten as a full meal and can make a great snack. They love finding a biscuit to put some honey on for a snack! Laura, it has also helped not to have to dig around all the containers because they are all in one place! Congratulations on your book! I am excited for you and your family. For chili mac, I have just reheated chili and put over cooked spaghetti topped with shredded cheddar cheese and chopped onions. The key is to give it a fancy name. I call that one Chicago Style Chili Mac. Not sure if that is even true, but it’s all in the name. I call sliced oranges- Orange smilies(inspired by the kids stuffing them in their mouths and smiling to reveal the peel). Sliced oranges-ho hum, Orange Smilies- All Right!!! Wierd. I am an absolute fan of left-overs!!! I make a stir fry with noodles or rice. Because I cook home made all the time, this meal feels like a break. Yea for left-overs!! !